Warner Horizon has picked up Red Brick Road, a retelling of Wizard of Oz that goes far beyond Kansas. There's something about The Wizard of Oz that, over a century later, continues to inspire frequent retellings. For example, even though Disney's Oz: The Great and Powerful is set to hit theaters this year, Warner Horizon has also picked up an Oz-inspired television series called Red Brick Road. Where Wizard and Oz deal with Dorthy and Oz respectively, Red Brick Road will re-envision the entire magical world against the backdrop of a Game of Thrones-styled political drama. Details are sparse regarding Red Brick Road's plot, but the series is currently being described as a large-scale continuation of The Wizard of Oz, complete with political intrigue and violence. 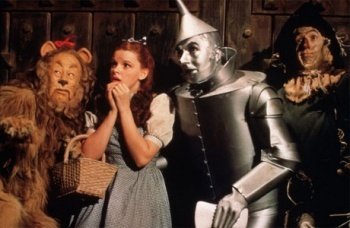 L. Frank Baum's original novel hinted at various magical conflicts and machinations that occurred prior to Dorthy's arrival, which could certainly be expanded upon for a television series. Given that the story ended with Oz leaving the Emerald City and two Witches dead, one can imagine other factions quickly moving in to fill the power vacuum left behind. Red Brick Road is created by Rob Prior and produced by Mark Wolper, Roy Lee, and Adrian Askarieh. Individually, these producers are responsible for such projects as the Hitman reboot, a Psycho prequel called Bates Motel, and Leonardo da Vinci and the Soldiers of Forever. It will still be some time before we find out what they have planned for the well-explored Oz universe, but at the very least they should bring no shortage of unique ideas to the mix.